Transportation, Maritime, and Communication Minister Ahmet Arslan has announced that the Yavuz Sultan Selim Bridge's toll will be set at $3 plus value-added tax (VAT). The opening ceremony of Istanbul's third bridge, which connects the Asian and European sides of Istanbul, will be held on Aug. 26. Arslan said: "The bridge toll of the Yavuz Sultan Selim Bridge, a project that is much-anticipated by Istanbulites, will connect the two sides of Istanbul for the third time and cost $3 for each automobile." Arslan also added that VAT is not included in the $3 toll, which is the determined price for one-way passage. Arslan said that the megaprojects in the field of transportation, which are part of Turkey's 2023 goals, will "continue nonstop." Following the Gülenist Terror Group (FETÖ) coup attempt, the opening ceremony was originally thought to be compromised but it will continue to go ahead on the scheduled date, Aug. 26. 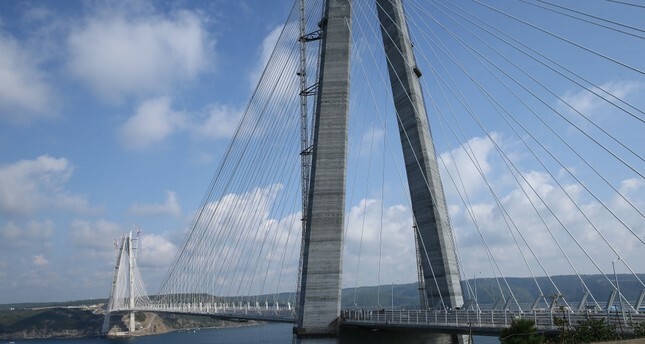 The Yavuz Sultan Selim Bridge will be the second bridge to be operated by the private sector. Constructed over the Bosporus Strait as part of the North Marmara Highway Project, one of the world's longest bridges, cost $3 billion to construct. Consisting of eight lanes of motorway and two lanes of railway in the middle, the bridge's Odayeri-Paşaköy section will be 148 kilometers long. Stressing that it would be the first bridge in the world to feature both a railway and motorway on the same deck, Arslan said while the bridge breaks the world record for its length of 59 meters and its 322-meter tower, it is also the longest suspension bridge in the world to feature a railway, spanning 1,408 meters and 2,164 meters in total length. Expected to ease Istanbul's transit traffic and reduce air pollution and environmental problems associated with car exhaust from Istanbul's extreme traffic problems, the third bridge is expected to save the country $1.79 billion in economic resources, $1.45 billion in energy and $335 million in labor, according to Arslan. Work is in progress on the 169-kilometer-long Kurtköy-Akayazı connection and the 88-kilometer-long Kınalı-Odayeri section, both of which are also part of the North Marmara Highway project. Arslan also said that access roads, spanning 257 kilometers, are expected to be completed by 2018 and that all sections of the North Marmara Highway will be put into service by then. The divided road network in Turkey has rapidly expanded over the past 12 years. A total of 6,101 kilometers of divided roads in 2003 reached up to 24,280 kilometers while 1,714 kilometers of highways increased to 2,289 kilometers. The combined length of bridges in the county was 311 kilometers in 2003, increasing to 465 kilometers over the past 12 years and 50 kilometers of tunnels increased to 263 kilometers in the same period. Some 6,328 kilometers of divided roads and 5,892 kilometers of highways are expected to be put into service by 2023.